How Far is JVC Ganesh? 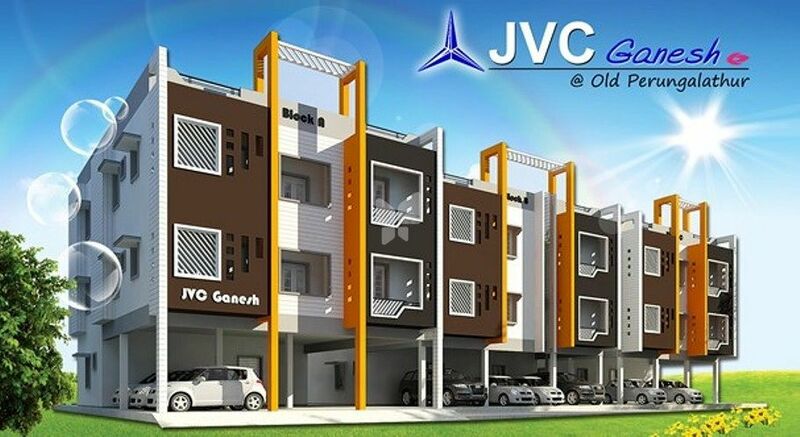 JVC-Ganesh is JVC HallMark Constructions’s latest residential project in Chennai. This 3 floors, 1 towers project comes from a developer who has a history of using authentic materials and making use of space in a modern way. In JVC-Ganesh you will find not only beautiful but also high quality Apartments / Flats. It is conveniently located at Old Perungalattur in Chennai city. The nearest landmark is Near Perungalathur Bus Stop. The project offers 1,2 BHK Apartments / Flats within 512 - 985 Sq.Ft. This project by JVC HallMark Constructions is in upcoming stage. The luxury homes are available at attractive price starting from 20.99 Lac. Crafted to perfection these upscale apartments offers covered car parking and amenities like Corporation Water. The lifestyle and amenities at JVC-Ganesh were conceived with wide open views to give you a peaceful living environment with the correct mix of work and play amenities. Earthquake resistant foundation with R.C.C M20 grade concrete. Superstructure Brick Masonry with good quality bricks in cement mortar. Main Door Frame Best Teak Wood frame, Shutters Best Teakwood Door shutter designed with melamine polishing and designer hardware. Internal Door frames Best Country wood Frames: Shutter Molded & Paneled Door Shutters with good quality hardware. Window frames & Shutters of good quality UPVC with glass panels. Plain design MS painted grills and high standard hardware. Designed compound wall with combination of cement concrete & masonry . Bedrooms, living room, balconies, dining rooms and kitchen-24x24 vitrified flooring with 4 skirting. Bathrooms & utility room ceramic non-slipper acid-resistant tile flooring. Staircase : Anti-skid step tiles. Parking Area Rack make designer Interlocking paving blocks. Kitchen Glazed Ceramic Tile Dado up to 20 height above kitchen counter. Bathrooms & Powder Room Glazed Ceramic Tile Dado up to 70 height. Well planned toilet layout with wet & dry areas. Wall hung EWC with flush tank & wash basins .All bathrooms have hot & cold wall mixer with shower. All CP Fittings are Chrome Plated of Parryware make or equivalent. Seperate borewell with pump and OHT. Scientific Septic tank with linear drain soak trences. Rain Water Harvest to charge the borewell. Dedicated 11 KV/440V Feeders to ensure quality power. Concealed Copper Wiring in PVC Conduits. Power outlets for air-conditioners in all bedrooms & living room. Power plug for cooking range, chimney ,refrigerator, microwave, mixer grinder in kitchen. Backup power : Provision for backup power through invertor for all fans, lights and specific plug points in each villa. 3 Phase supply for each unit and individual meter boards. Miniature Circuit Breakers (MCBs) & ELCB. All electrical modular switches & sockets of Crabtree or equivalent make.